Whatever happens in polling stations next month, it will still be a man’s world in Newtown’s council chamber as just 19 of the 75 candidates seeking seats on Scottish Borders Council on Thursday, May 4, are female. And that, according to outgoing Tweeddale West councillor Catriona Bhatia is “deeply disappointing”. Scottish Borders Council Leader David Parker with outgoing councillor Catriona Bhatia. Mrs Bhatia, daughter of Liberal Democrat grandee Lord Steel of Aikwood and one of just five women among the council’s 34 elected membes, said she is saddened that so few female candidates are going to the polls. “This is not me being politically correct for the sake of it, but there is something fundamentally wrong if we again end up with a council on which women, who make up half the electorate, are so poorly represented,” said Mrs Bhatia, now standing down after 14 years as a councillor. “At the last council election in 2012, we had 16 women standing out of 72 candidates, and just five female councillors were returned. When the deadline for nominations closed last week, it emerged that 13 of the current crop of councillors, including three of its handful of female ones, are not seeking re-election. 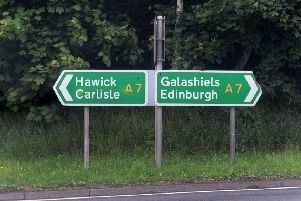 They include five of the six Lib Dem incumbents – Mrs Bhatia, Vicky Davidson in Selkirkshire, Alec Nicol in Kelso, council convener Graham Garvie in Tweeddale East and Ron Smith at Hawick and Hermitage. Also calling it a day are Conservatives Gavin Logan in Tweeddale East and Keith Cockburn at Tweeddale West, along with the Scottish National Party’s Joan Campbell in East Berwickshire, Bill Herd in Galashiels, Alastair Cranston at Hawick and Denholm, Jim Torrance in Melrose and Leaderdale and Willie Archibald in Tweeddale West, as well as independent Michael Cook in East Berwickshire. A total of 19 independents, all men, will contest the 11 multi-member wards on May 4. Of the other candidates, 18 are Conservatives, 13 are SNP, nine are Lib Dems and nine are Labour. The Greens, after putting up just two candidates in 2019, will go with seven this time round. The youngest candidate is Catriona Bhatia’s 18-year-old student daughter Caledonia. She will take on seven rivals for the Lib Dems in Galashiels, the only ward to return four councillors. Of the 10 three-member wards, Selkirkshire has attracted the most candidates, with nine taking their chance. Hawick and Hermitage will be contested by the fewest candidates with just four declared. Tweeddale West will see the biggest turnaround of members as all three of its sitting candidates – Mrs Bhatia, Mr Archibald and Mr Cockburn – won’t be standing for re-election.